The soft, mumbled rasp. The courtly gestures. The cat. Marlon Brando’s performance as Don Corleone draws most of its iconic power from the movie’s opening scene, which may be cinema’s supreme portrait of true power, wielded quietly, with no need for histrionics. Much like his heir for the title of greatest living actor, Daniel Day-Lewis, Brando had the remarkable gift of being able to radically transform himself in manner, voice, and appearance while retaining the moment-to-moment truthfulness and spontaneity associated with the Method. It’s a stupendous performance, richly deserving of the Academy Award. 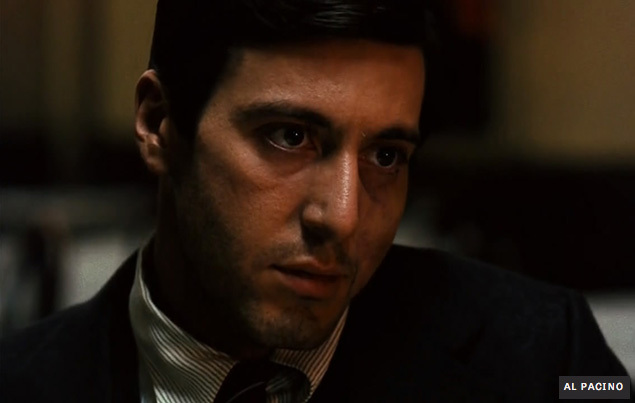 Michael Corleone is The Godfather’s protagonist. The Don gets shot about 40 minutes into the film’s three-hour running time, and while he survives and has a few scenes thereafter, virtually everything memorable about Brando’s performance occurs in the first couple of reels. By any sensible reckoning, he should have been nominated for Best Supporting Actor, which he surely would have won as well (stealing the prize from Cabaret’s Joel Grey). But it’s hard, even today, for AMPAS members to look past actors’ stature and presence, and consider only the size and function of their roles. Furthermore, if ever there were a case to be made for a relatively brief performance qualifying as a leading role, this is the one. Try to find a copy of The Godfather on DVD or VHS with artwork that doesn’t have Brando front and center. 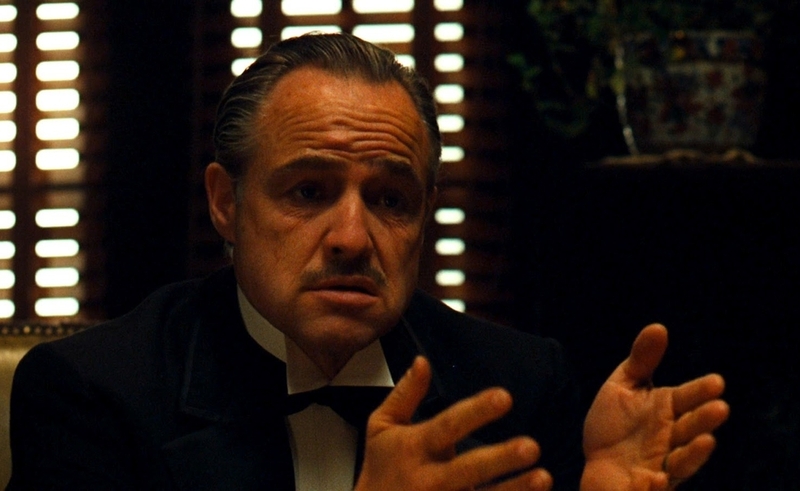 Don Corleone isn’t the film’s central character, but in certain key respects, he’s its most important character; had that role been miscast, The Godfather might be dimly remembered today as a typical pop-lit adaptation of the era (like, say, The Poseidon Adventure, released the same year), rather than revered as one of the medium’s towering masterpieces. So maybe it wasn’t a goof after all. Maybe. 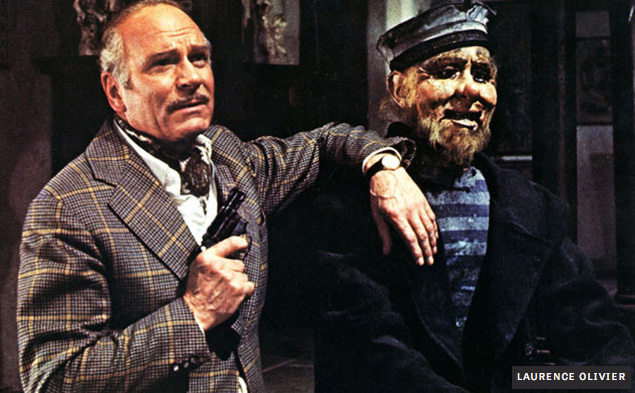 Laurence Olivier is the personification of dignity. He’s remembered as a film actor primarily for his Shakespeare adaptations, and as Heathcliff in Wuthering Heights—roles that called for a regal bearing and impeccable diction. 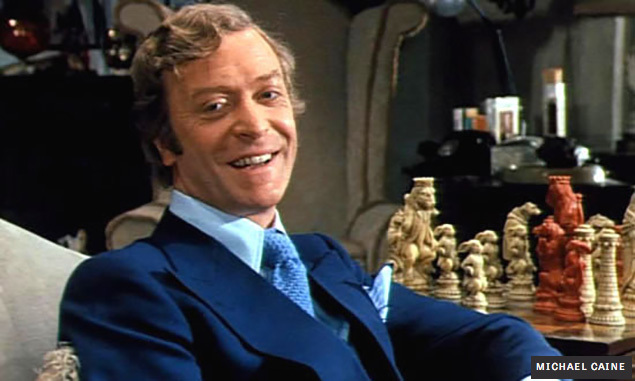 Sir Larry was perfectly capable of getting funky if he needed to, though, and he’s entertainingly manic in Sleuth, playing a celebrated mystery writer who gets involved in a series of increasingly dangerous games with the man (Michael Caine) who’s having an affair with Olivier’s wife. Anthony Shaffer’s stage play is too much of a contraption to permit truly great acting—these are nonstop plot motors, not characters—but it’s fun to watch Olivier relish the opportunity to play someone who isn’t remotely reserved; along with The Entertainer, Sleuth offers the best indication of his range, which was more formidable than the movies generally allowed him to demonstrate. He changes accents in mid-sentence for fun, prances around in silly costumes, and times his lines to coincide with the dialing of a rotary telephone (speaking faster for smaller numbers, slower for bigger ones). He’s unmistakably having the time of his life, and his joy is infectious. All the same, it’s pretty shocking that the New York critics went for him in the year of The Godfather, and in fact it was apparently a compromise choice after members became deadlocked between Brando and Pacino. (As a voting member of the NYFCC from 2001-2008, I saw for myself how this happens. It isn’t deliberate, just a weird hiccup of the bylaws.) And even that was part of another compromise, which I’ll address below when I get to my pick for Most Overlooked. The organization wasn’t formed until three years later, so instead, I’ll address one of Brando and Olivier’s fellow Oscar nominees: Michael Caine, also in Sleuth. (WARNING: There’s no way to discuss this performance without revealing a major spoiler for this film. Those who don’t want to know should skip to the next paragraph.) By contrast with Olivier, Caine plays it relatively cool in the first half (that is, the first act), in keeping with his character’s wariness—he doesn’t know why the man he’s cuckolding has summoned him, and is correctly suspicious. But I imagine viewers of the day were primarily impressed by his transformation into what appears to be an entirely new character in the second half, later revealed to be the original character in heavy disguise. Like the stage play, the movie was so intent on fooling audiences that it credited a fictional actor, Alec Cawthorne, as Caine’s second “character”; the moment he yanks off the bald cap and heaps of latex is meant to be flabbergasting. And maybe it was, I don’t know. Certainly Caine was less famous back then (though he’d already appeared in Alfie, Get Carter, and The Italian Job). Seen today, however, it’s so obviously Michael Caine in disguise, doing a funny voice, that the movie pretty much screeches to a halt for the duration of the ruse, as Olivier’s character fails to notice the obvious. Caine is almost never bad, but this wouldn’t even rank in his top 30 performances; his nomination was in recognition of the stunt, and would likely have gone to any actor cast in the part. There we go. As ever, the NSFC paid no attention to what anybody else was doing, awarding Pacino in the category in which he actually belonged. (He was Oscar-nominated in the Supporting Actor slot, alongside James Caan and Robert Duvall.) What’s astonishing about this performance now is how supremely controlled Pacino is, to the point where he’s almost unrecognizable as the actor we know today. His voice hadn’t gone ultra-gravelly yet, but much more than just the soft-spoken, almost adenoidal timbre stands out as unusual. It’s one of the only times in his career he’s played a character who’s fundamentally closed off from the world—the movie is the (tragic) story of his gradual awakening, and he spends much of it either frightened or uncertain, observing from the sidelines. No doubt that’s why it was possible to mistake him for a supporting actor (coupled with his being a relative unknown at the time). But the movies have given us few slow metamorphoses this convincing or this chilling. It’s as if, say, the entire character arc of Walter White on Breaking Bad, from car-wash gofer into Heisenberg, were compressed into just three episodes of the show. It sounds impossible, but that’s more or less what occurs. And Pacino pulls it off without once relying on the bag of demonstrative tricks that quickly came to define his career. Since I place him and Brando in separate categories, I’m not forced to choose; if you are, what do you do? Originally, my choice for this honor was Stacy Keach in Fat City, a superb film worth seeking out. However, Keach had in fact technically won Best Actor from the NYFCC that year—and they changed the rules in the middle of voting to prevent it, resulting in the aforementioned standoff between Brando and Pacino that gave the prize to Olivier. Sure, it was a bit goofy that the group had, up to this point, allowed victory with a mere plurality of the vote, rather than requiring a majority, as it has ever since; but that’s something to be discussed before votes are cast, not after. Appalling. Also, Keach apparently won Best Actor (tied with Brando) from the Kansas City Film Critics Circle, a group I’m surprised to learn even existed as early as 1972. (It was founded in 1966.) So it’s not terribly accurate to claim that he was overlooked by the era’s tastemakers. 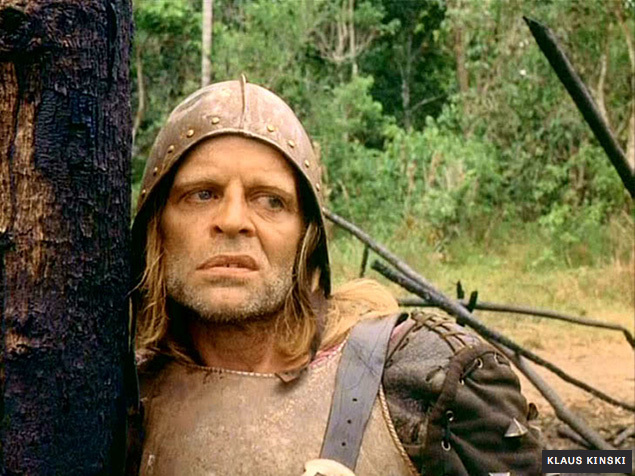 Instead, I’ll cheat a little—in that Aguirre, The Wrath Of God wasn’t released in the U.S. until 1977—and pay tribute to Klaus Kinski, in what’s perhaps his most intense role (which is saying a lot). As a Spanish conquistador in search of El Dorado, Kinski doesn’t seem to be acting in any conventional sense, so much as he’s channeling a madman. Though he’d been appearing in films since 1948, it wasn’t until he hooked up with Werner Herzog in Aguirre that he achieved total fearlessness, even recklessness. Here, he simply embodies hatred. Don Lope de Aguirre despises everybody and everything, and walks through every shot radiating sheer contempt, not just for the men he commands, but for the planet, and God. (And for monkeys.) At the same time, though, Kinski has enough restraint that he doesn’t particularly stand out during the movie’s early scenes, before Aguirre takes charge. For a surprisingly long time, he’s just one of the ensemble, so much so that a viewer unfamiliar with Kinski might have no idea who the protagonist is supposed to be. To plausibly get from there to Aguirre’s unforgettable, feral finale is a feat as impressive as Pacino’s in The Godfather, albeit at the the opposite end of the self-control spectrum. 1972 was a banner year for stealthy moral corruption.